Cumbernauld United went down 3-1 to Ayrshire side Kilwinning Rangers at Guy’s Meadow on Wednesday night. 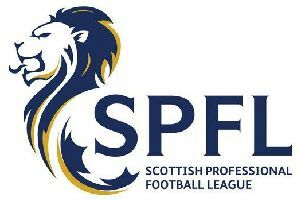 It was expected that this league encounter would be an exciting contest, United having recently enjoyed two great results to maintain their position in the Super League First Division and Kilwinning having to be sure of the three points to keep in contention in the promotion race to the Premier League. The game however never reached the standard expected. Both team struggled to produce their best form in the night. There was an abundance of free-kicks and neithger goalkeeper had any outstanding saves to make. It was a very disappointing match but overall the big, strong Ayrshire team deserved to take the honours and keep up their challenge for promotion. The visitors began in determnined fashion, laying siege to the Cumbernauld goal, and got their reward in the fifth minute in a rather fortunate manner. Following a ball from the left, Rangers’ Liam McGuinness headed towards goal and Kieran Brown’s clearance unfortunately rebounded off Kilwinning’s Ben Lewis to end up in the net. The Buffs continued on the offensive and United were lucky not to go two down when Dean Agnew robbed home defender James Brown and shot against the crossbar and over. United came back for a spell but a spate of free-kicks for either side spoiled the flow of the game. Just prior to the interval a Kris Irvine shot came near for Cumbernauld but it had been a pretty dismal first 45 minutes. Kilwinning resumed after the break determined to add to their lead, forcing a number of corner kicks but the home defence stood firm. After Dale Clark replaced Simon Eeles and skipper Ryan Sullivan was booked it was United who shocked Rangers when, following a flag kick, the referee pointed to the spot, spotting an infringement in the box. Irvine scored from the resultant penalty to equalise for the home team, time 57 minutes. United’s joy however was short lived as five minutes later the Buffs regained the lead when substitute Jamie Anderson headed home. The same player almost scored again when United ’keeper Barry Fraser raced out of his box to get to the ball and was beaten to it by Anderson. Fortunately for United the Kilwinning man shot past. The Buffs however did get a third goal just before the final whistle when Lewis picked up a ball some 30 yards out to run and and slam past Fraser, giving the Ayrshire team the victory they needed. Tonight (Wednesday) Cumbernauld travel to play Cumnock to play their last league fixture, kick-off 7.30pm.